To ask other readers questions about Nothing But the Night, please sign up. Arthur is traumatised by an incident involving his father. A memory he strives to suppress. A man he tries to avoid. In contrast, his memories of his mother are fond, intimate, and intense. It’s dripping with watery metaphors. The delicate heart of the story is an unspecified, but terrible, incident that Arthur tries to forget, as he was advised to do. Awake or dreaming, he tiptoes around the edge of memories of the event itself, like picking a scab, but not daring to pull it off and expose the wound. It is “obscured by the habitual force of conscious will”. There is another sort of repression: clumsy and pejorative hints about the probable homosexuality of at least one character, but that is never fully explored. Cartoon: “Don’t kid yourself. 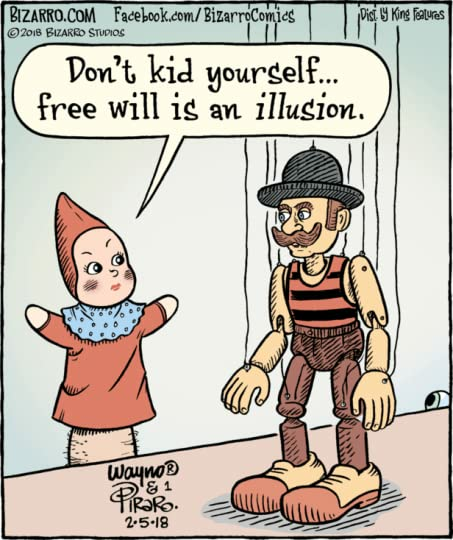 Free will is an illusion”, one Bizarro puppet tells another. The dreaminess and conscious forgetting compound Arthur’s sense of being controlled: by events, by his father, and of course, his memories. There’s even a mesmerising showgirl called Volita, who dances more like a puppet possessed, than of her own volition. Such a view can absolve one of guilt for anything and everything, but the price is to accept and entrench one’s powerlessness. Who wants to be a victim or a toy? Isn’t it better to face the truth and be free - to feel, even if it’s painful? •	“There was a swollen river in him”, so the dam wouldn’t hold. 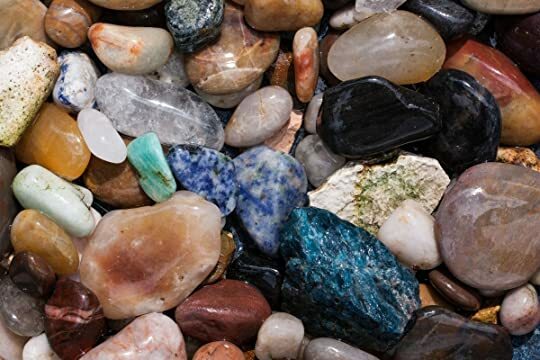 Maybe Williams lost the momentum to polish the final rough stones, and that is why he later disowned it. Maybe it was a deliberate reflection of the arc of Arthur’s life. •	“Moonlight slithered through the open lattices” and later it “sifted”. John Williams (not the composer of Star Wars, Jaws, Close Encounters, Superman, ET, Jurassic Park, Schindler's List, Harry Potter, and others) published three novels between 1960 and 1972 (the era of the Cold War, of the Cuba crisis, the Vietnam War, the Black Panther movement). The last of them, Augustus (review HERE), winning the National Book Award. But his works gradually gathered dust on forgotten shelves until Stoner (nothing to do with dope - see my review HERE) was reissued in 2003 by Vintage and then by New York Review Books Classics in 2006. Its popularity slowly swelled, bringing Augustus and Butcher’s Crossing (review HERE) in its wake. Momentum built on GoodReads, too. •	Stoner currently (10 July 2018) has 66,679 ratings, averaging 4.29*, with 8,138 reviews. •	Butcher’s Crossing has 8,997 ratings, averaging 4.11*, with 940 reviews. •	Augustus has 6,259 ratings, averaging 4.19*, with 677 reviews. But this, his first novel from 1948, was left behind. He wrote it when he was only 22, while he was in Burma during the war, recovering from plane crash. It has only 519 ratings, averaging a mere 3.11*, with 66 reviews. But maybe that will change, now it's been reissued (February 2019) by New York Review Books Classics. Having loved the other three, and knowing Williams had disowned this youthful (aged 26) work, I was wary of reading it. But I succumbed, and am glad I did, even though it could not and did not reach the brilliance of its successors. All four are more about character than plot, and start with a young man breaking away from his roots, trying to find himself, and forge his life. But whereas Stoner and Augusts chart a lifetime, and involve complicated relationships with wives and daughters, Butcher’s Crossing is a few months, and this a mere 24 hours. Butcher's Crossing has something of the detail of tiny sensation that are so noticeable here. The relationships between men are generally complex, and often problematic; women are significant, but have softer power. Augustus is startlingly different in form, being epistolary and historical. All have a degree of bleakness, but the better known trio have plenty of hope and beauty for balance. See this interview with Nancy Gardner Williams: HERE. The novel-of-a-single-day, with incredible attention to detail, reminded me of Nicholson Baker’s 1988 novel, The Mezzanine (see my review, HERE). And for a few chapters, the telephone assumed huge significance. Not in a sexual way, but it again brought Baker to mind, for Vox (see my review HERE). I doubt there’s a connection, but if so, Williams was first. The strongest theme, of suppressing what one doesn’t want to know or remember, has many parallels with Ford Madox Ford’s 1915 novel, The Good Soldier (see my review, HERE). However, the protagonists of the two books are trying to ignore very different things. Kafka is also relevant. Like Arthur, he sometimes felt parasitic and controlled, and he had a very fraught relationship with his father, albeit for different reasons. Kafka wrote his grievances in Letter to His Father, whereas Arthur receives a life-changing letter from his father. This is a good book, but not a great one. If I hadn't known the author and adored his later works, I think it would have been only 3*. Its importance lies in seeing the early work of a superb writer. I strongly suggest you read those greats first. Then you can more easily spot the gems in the shingle. And they are many. nulla, appunto: solo una noiosissima notte. la pubblicazione degli esordi letterari dovrebbe essere regolata dal codice civile, articolo per i danni morali, paragrafo non aprite quel cassetto. sto valutando di chiederli a fazi (i danni), perché è stato davvero un colpo basso espormi ai tentennanti vagiti narrativi e stilistici del papà di stoner. la storia qui è inesistente e la famosa scrittura pulita di JW è solo desertificazione, lessicale e sintattica (a conferma che aprire i cassetti degli i nulla, appunto: solo una noiosissima notte. la pubblicazione degli esordi letterari dovrebbe essere regolata dal codice civile, articolo per i danni morali, paragrafo non aprite quel cassetto. sto valutando di chiederli a fazi (i danni), perché è stato davvero un colpo basso espormi ai tentennanti vagiti narrativi e stilistici del papà di stoner. la storia qui è inesistente e la famosa scrittura pulita di JW è solo desertificazione, lessicale e sintattica (a conferma che aprire i cassetti degli inediti può essere perfino peggio che fidarsi di una recensione di d'orrico). in ogni caso la fase dibattimentale si è interrotta ieri sera a pagina 45. un terzo del libro ed ero ancora - come da titolo - nel mezzo del nulla più nulla. quindi sai che c'è, buonanotte. Oh never fear, man, nought’s to dread, . Look not left nor right: . In all the endless road you tread . There’s nothing but the night. .
As I was suffering from withdrawal symptoms after reading three excellent books in succession by John Williams and knowing that there was only a novella of his remaining for me to read, I jumped into the pages of this book with a very open mind. This was Williams’ first novel published when he was twenty-six. Yes, it is raw in style and there were Oh never fear, man, nought’s to dread, . This was Williams’ first novel published when he was twenty-six. Yes, it is raw in style and there were shades of “The Ginger Man”, by J.P. Donleavy to be found there but in spite of this it is mesmerizing and it is evident that the author thoroughly enjoyed himself writing it. I feel, however, that none of his following three books can be compared to this infant. I guess Williams was still finding his voice. This is an intriguing, dramatic and metaphysical but somewhat depressing story. Nevertheless, there is a fascinating chiaroscuro effect that shines throughout the somewhat clipped prose and brilliance is to be found within. This is a day in the life of Arthur Maxley, who as a child suffered a very traumatic experience and the only way he can handle it is to put it to the back of his mind where it resides like an archived file. Unfortunately, this hidden memory does from time to time escape with rather dire consequences. Arthur to the present day continues to be so traumatized that I wouldn’t call him your average easy going individual. He screams very easily and becomes distraught when shouting Mother, Mother, Mother. Everything is thought about in minute detail but then he’s an individual who spends a lot of time on his own. It’s odd but I felt that I was observing the internal mind of this individual and not the persona that he presents to the world. Everything he did in life was either darkness or light. His father Hollis has been abroad and naturally wishes to see his son. This meeting in a restaurant in itself proves to be a painful experience for the pair of them and, with the tension visibly mounting, it soon becomes apparent how the mother/wife fits into the scenario. It is the mother who fascinated me. The descriptions of her are shown in minute detail. As a child Arthur loved her dearly, in fact he appeared to treat her more as if she were a kind of possession. Then, with a shrieking clash of music, it was over. And with that final discordant beat, Volita spanned the width of the floor in one tremendous, exultant leap and landed with panther-like grace and ease only a few feet in front of his table. Upon her face there was an expression of deep, exultantly fierce, almost mad ecstasy. And he was instantly unaware of his surroundings. His eyes were compelled and frozen by that face before him which grew and grew in his vision, swelled to an unbelievable proportion, menacing and insatiable. Then Arthur had a vision. This section of the book becomes a mixture of romance and burlesque and then finally there is an event that is tantamount to a Greek tragedy. The ending astounded me in fact. Williams may have disowned his first published novella. Nevertheless, it was still the book that set him on the right track for his further three albeit latterly successful novels. Consequently, I think it is worthwhile reading how this book saw the light of day. In 1942 he was shipped to India, where he served as a radio dispatcher on missions that flew over the Himalayas to supply troops deep in the jungles of Burma — "flying the hump," as it was called. After it was over, Williams rarely mentioned the two and a half years he spent in the China-Burma-India theatre, other than to note that he used much of his tedious downtime to write and rewrite his first novel, “Nothing but the Night”, a murky psychological study of a troubled young dandy that he would later emphatically renounce. In 1945 Williams returned to civilian life. He spent some time with his family, who had moved to California, then drifted to Key West, where he helped launch a radio station. He continued to tinker with his novel, sending drafts off to New York editors, who called it an overblown, overwritten short story. Discouraged but stubborn, Williams sent the manuscript to Alan Swallow. It was a life-changing move. A Wyoming native, Swallow had founded a small press in Denver dedicated to bringing out serious new writers that mainstream publishers neglected. He was also in the process of launching a creative-writing doctorate program at the University of Denver that would be only the second of its kind in the country. Swallow found “Nothing but the Night” "rather dreary" and "somewhat overdone" — but not so terrible for a first novel. He told Williams he'd publish it under his own imprint, even though he would certainly lose money on the deal. "You may well be a writer who needs to throw away two or three novels before the thing starts clicking," he wrote to the jubilant author. The book was published in 1948 and disappeared quickly. Nevertheless, I am actually rather taken with this book. I don’t know why either. Stoner by John Williams remains one of my favorite novels, and is not in danger of being replaced by this one. This reads more like ps This cover, man, I don't know. Eh - not as good as Stoner. John Williams’ first book is a quick read and not just because it’s a novella but because Williams was a good writer right out the gate and his prose is very smooth and accessible. The quality of the writing, the pacing and some of the scenes, particularly the key scene where we see what happened between his mum and dad, were ok. But there’s barely anything here to hold the attention - a traumatised dude does not get up to much beyond going stir crazy in his apartment! He meets a leech of a friend who begs for money, he has an awkward lunch with his dad and then goes on a disastrous drunken night out - it just wasn’t enough for me. In this New York Review of Books edition, there’s an interview included at the back with Williams’ widow, Nancy, who reveals that he wrote this short book at just 22 years old while serving in the Air Force during WW2 (this was the only way he could go to university - to have the government pay his way in exchange for service in the war); an impressive fact alone. He had been shot down on a mission over Burma and he was one of the three survivors from the crash - the other five men died. He wrote the book out of boredom as there was nothing else to do in the area he was convalescing. But I wonder if the trauma the main character experiences in several rambling scenes, many hallucinated, was Williams subconsciously working through the trauma he experienced during the war - dealing with being surrounded by so much death? The interview is informative in many regards, not least as I found out Williams became an alcoholic in his final years, his wife intimating that the memories of the war were harder for him to deal with towards the end. In that sense, perhaps this book is an accurate and illuminating portrayal of what it’s like to live with trauma? I’m lucky enough not to know but, even if it is, it didn’t make for compelling reading. I found those sequences - the ones where he imagines himself floating - overly literary, like what a young writer might think they’re supposed to write to be taken seriously, dull, and pretentious more than anything. I’ve read John Williams’s novel Stoner three or four times; I’ve studied it and consider it a perfect novel. This novella, 123 pages, first published in 1948 and written by twenty-two-year-old Williams when he was enlisted in the Army Air Force, portends the talent of Stoner and Williams’s other books, so it is worth reading. But it is young, overly earnest, self-conscious, and sometimes even melodramatic—as are many young writers’ first novels; this is not a criticism, just a fact of immaturit I’ve read John Williams’s novel Stoner three or four times; I’ve studied it and consider it a perfect novel. This novella, 123 pages, first published in 1948 and written by twenty-two-year-old Williams when he was enlisted in the Army Air Force, portends the talent of Stoner and Williams’s other books, so it is worth reading. But it is young, overly earnest, self-conscious, and sometimes even melodramatic—as are many young writers’ first novels; this is not a criticism, just a fact of immaturity. It feels a little like an actor’s sense memory exercise where you break things down to their essential beats and live every one of them—in this case, at aha amplitude. I can’t find the reference, but I think I recall reading that Williams wanted to bury this novel, and I understand why. He had grown, matured, turned into an artist, and this is the work of his child self. I revere Williams and am interested in his genesis as a writer. So that’s a good enough reason to have read it. The much celebrated author of "Stoner" and "The Butcher's Crossing" failed to fully accomplish the purpose of his first novel's premise. The prose is boringly wordy and somewhat lost in endless descriptions that subtract the desired effect of the substance. The writing is quite good at times, but Williams' genius (seen in wonderful images and atmospheres) is compromised by an excessive urge to explain too much, to uncover what should remain hidden. Perhaps because the novel takes place in that t The much celebrated author of "Stoner" and "The Butcher's Crossing" failed to fully accomplish the purpose of his first novel's premise. The prose is boringly wordy and somewhat lost in endless descriptions that subtract the desired effect of the substance. The writing is quite good at times, but Williams' genius (seen in wonderful images and atmospheres) is compromised by an excessive urge to explain too much, to uncover what should remain hidden. Perhaps because the novel takes place in that thin line that separates dream from reality and Williams feared to lose the thread. Was zähmt dich nach einem gewaltvollen Trauma? Was lässt die Dunkelheit in dir letztlich wieder hervorbrechen? In „Nichts als die Nacht“ erzählt John Williams novellenhaft von zwölf Stunden eines gescheiterten Lebens. Lethargie, Müdigkeit, soziale Ängste umgeben den 24-jährigen Arthur Maxley. In einer einzigen Nacht bestimmen drei Menschen den Fortgang des Ganzen und lassen ihn alles Elend spüren. Man merkt diesem ersten Werk John Williams eine unfassbare Angst vor dem Leben an. Das schaurige, un Was zähmt dich nach einem gewaltvollen Trauma? Was lässt die Dunkelheit in dir letztlich wieder hervorbrechen? In „Nichts als die Nacht“ erzählt John Williams novellenhaft von zwölf Stunden eines gescheiterten Lebens. Lethargie, Müdigkeit, soziale Ängste umgeben den 24-jährigen Arthur Maxley. In einer einzigen Nacht bestimmen drei Menschen den Fortgang des Ganzen und lassen ihn alles Elend spüren. Man merkt diesem ersten Werk John Williams eine unfassbare Angst vor dem Leben an. Das schaurige, unheilvolle Leben wird in der Nacht durch alle Metaphern, die nur möglichst wenig Licht in eine verschattete Seele lassen, getrieben. Was für eine erzählerische Kraft, was für eine Energie! Ich war von Beginn an sehr angetan von diesem Stück Kurzprosa und es hat mich definitiv von einer Sache überzeugt: John Williams ist mittlerweile einer meiner liebsten Autoren. Das Gefühl stellte sich bereits 2015 zur Lektüre von „Stoner“ ein und setzte sich bei „Butcher’s Crossing“ und „Augustus“ fort. Wie viel Einsamkeit er eine einzige Person spüren lassen kann und wie expressiv man eine Nacht beschreiben kann. Sehr überzeugend insgesamt – empfehle ich vor allem, wenn man davor bereits etwas von Williams las. Una giornata trascorsa con Arthur Maxley, parassita della società, come si definisce lui stesso. Un cerchio esatto da un’estasi alcoolica all’altra, da una notte all’altra. In realtà Arthur è un uomo spezzato, un grande dolore lo rende impermeabile a tutto, vive l’alcool come allontanamento dalla realtà e allo stesso tempo come unico filo che lo unisca ad un passato che ama, che a volte rinnega, che cerca di capire e che rivive nella sua mente in mille modi diversi. Un giorno disturbante per cer Una giornata trascorsa con Arthur Maxley, parassita della società, come si definisce lui stesso. Un cerchio esatto da un’estasi alcoolica all’altra, da una notte all’altra. This is one of the books that I know technically great, but just leaves me a bit cold. I think part of it is that the twist, if twist it is, wasn't that, well twistful. It would make a good book for discussion for some aspects of the story. But there was something about it that left me cold. Arthur Maxley wakes in his room, which he thinks is like his soul--dirty and disarranged. Shrugging off that thought, he slaps cold water on his face and determines to go for a walk. But he never gets to his destination, sidetracked to a cafe. His egg makes him think of an evil eye and depressed by the little cafe and ends up back home, the windows in his building seeming to leer at him. Maxley's nerves are disturbed by memories. Everything he encounters is magnified in grotesque ways, like circ Arthur Maxley wakes in his room, which he thinks is like his soul--dirty and disarranged. Shrugging off that thought, he slaps cold water on his face and determines to go for a walk. But he never gets to his destination, sidetracked to a cafe. His egg makes him think of an evil eye and depressed by the little cafe and ends up back home, the windows in his building seeming to leer at him. Maxley's nerves are disturbed by memories. Everything he encounters is magnified in grotesque ways, like circus sideshow mirrors, reflecting his inner world. Every word in John Williams' novel Nothing Like the Night reveals Maxley's claustrophobic and overwrought psyche, the story culminating in the revelation of the horror Maxley witnessed and his irrational acting out of his trauma. Is this book by the same man who created William Stoner in Stoner, the novel so constrained and elegant, austere and yet moving? Both novels are dark, but Stoner's resolution is comforting in his final acceptance of his life. Night leaves the protagonist still lost in the dark. Violence becomes his speech and there is no health in him. Nothing But the Night was Williams' first novel, written during the war when he flew supplies "over the hump" and saw his fellow soldiers die. Only a mentor with a small press believed in him enough to publish this novel. Williams learned from his mistakes and went on to write "the perfect novel" Stoner and the National Book Award winner Augustus. It was fascinating to read this early novel, at once a failure and yet showing Williams ability with words and insight into human nature. The story is disturbing and memorable, a psychological noir more suited for 2018 than 1948. Reading Stoner, I realized I had found one of my favorite novels ever. My inclination to read through John Williams' oeuvre was cemented when I discovered that he was an admirer of Willa Cather. 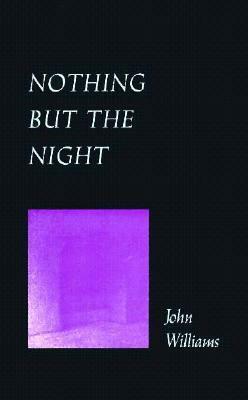 Nothing But the Night was Williams' first work, and was noticeably omitted from the recent NYRB reprints, which include his other three novels. I couldn't find much background on this book, but the short commentary on the internet isn't what I would consider positive. It was described as "turgid, overwritt Reading Stoner, I realized I had found one of my favorite novels ever. My inclination to read through John Williams' oeuvre was cemented when I discovered that he was an admirer of Willa Cather. It was described as "turgid, overwritten, and overblown." As much as I don't want to, I think I have to agree. Nothing But the Night lacks the crystal clear and concise writing featured in Stoner. However, cutting through the pretension and youthful ambition, one will find a compelling story of a young man struggling to grapple with the effects of an early trauma. We follow Arthur Maxley through his experiences with people and his surroundings. A narrator gives us insight into Arthur's thoughts and feelings. Indubbiamente scritto -ma non è motivo di stupore - in maniera egregia. Tuttavia ad una prima parte splendida, che introduce un personaggio "letargico" e senile, segue una seconda parte non altrettanto efficace. Per quanto sia piacevole l'eco di Proust e l'idea di fondo del romanzo (tutto incardinato sull'idea-simbolo della notte), non mi ha convinta del tutto. In ogni caso, lo consiglio, soprattutto a chi ama lo scrittore. Un esordio degnissimo di nota, da considerarsi una fase embrionale. "Tutt Indubbiamente scritto -ma non è motivo di stupore - in maniera egregia. Tuttavia ad una prima parte splendida, che introduce un personaggio "letargico" e senile, segue una seconda parte non altrettanto efficace. Per quanto sia piacevole l'eco di Proust e l'idea di fondo del romanzo (tutto incardinato sull'idea-simbolo della notte), non mi ha convinta del tutto. In ogni caso, lo consiglio, soprattutto a chi ama lo scrittore. Un esordio degnissimo di nota, da considerarsi una fase embrionale. Il primo romanzo di J.E.Williams. Insignificante prova d'autore, oggi pubblicata sull'onda del successo di "Stoner". Non vale nulla. È di un proto-minimalismo sconfortante. Mi ha ricordato il primo B.E.Ellis ("Meno di zero"), pur se privo della medesima forza devastante. Triste; noioso; circonvoluto; forzato; inutile. L'acquisto è stato un errore che non si dovrebbe commettere: cedere alla pubblicità in modo acritico, irriflessivo. Released while Williams was still in college, it has all the hallmarks of a debut novel: earnest, self-serious, and needlessly obfuscated. The hardcover is rarer than a pitcher who can hit a baseball, and you are all welcome to come over and see the one I received from Mrs Williams (God bless you, ma'am). 3.5 stars - but apparently it should only be 3 because at no stage while reading this book could I remember the title. I enjoyed the way it was written, but not much happens until near the end and then it concludes quite abruptly. It is the kind of book that you could read again and again and still enjoy the vivid imagery. Questa storia si svolge in una notte, ed è la storia di un giovane ragazzo dalla vita insofferente, dove incubi e realtà si alternano. Dove questo giovane dall’anima apatica si trascina per le strade della città di San Francisco, senza occupazione immerso nelle sue paranoie, paure e strani ricordi. Volendo DIMENTICARE SE STESSO. Definendosi spesso un parassita. “Dipingi quadri? Suoni? Cosa ci fai con queste mani, Arthur? Vive di ricordi dei momenti felici vissuti con la sua famiglia, dove regnava una serenità apparente e dove lui credeva che tutto fosse tranquillo. L’autore è molto bravo perché ti fa percepire le sensazioni che sente Arthur, riesce a farti entrare dentro le sue ansie e i suoi sogni. La grande bravura di Williams è che riesce a farti vivere ciò che accade al protagonista quella notte. Il passato per il giovane Arthur è una ferita lacerante, dove riuscire a dimenticare ciò che accadde quando era un bambino diventa impossibile. Dove non riesce e non si riesce a capire il motivo di quel gesto folle. Ed è proprio dopo quel gesto che la vita di Arthur cambia, cambia inevitabilmente e drasticamente. Per tutta la storia regna e riesci a percepire la solitudine che c’è nella vita di Arthur, quanto lui soffre e quanto per lui sia quasi inutile vivere. Vive in una totale apatia. “Non c’è niente di peggio che stare da solo, quando non sei abbastanza forte per affrontare i tuoi pensieri. Puoi sopportarlo fino a un certo punto, e poi…..Bè, alla fine non ce la fai più, e basta. Devi fare qualcosa, non importa quanto sia stupido. Devi convincerti che non sei solo, anche se lo sei!”. Ossessionato da pensieri scabrosi e sentimenti controversi, Arthur è costretto a districarsi nella rete ingarbugliata della realtà, faticando a distinguere la verità dai sogni e dai continui flashback che lo stravolgono. Questo è un breve ed immenso romanzo dove si mette in discussione e a confronto la relazione tra padre e figlio, un rapporto difficile come ne troviamo tanti al giorno d’oggi. Romanzo di esordio e ne ha tutti gli elementi. Approssimato, confuso, sospeso, con eccessi descrittivi a fronte di una inconsistenza di fondo. Molti elementi restano sospesi, altri sono scontati, altri ancora frutto di un virtuosismo poco convincente. L'ho comprato spinta dalla bella impressione di Stoner, mi dispiace aver buttato via i soldi. Romanzo (breve) d'esordio che poteva pure rimanere nel cassetto. Capisco che, però, avendo un autore di indubbio successo e richiamo, la tentazione di cavarne fuori qualche soldino sia molto forte. Bella scrittura ma nulla in confronto a quello che sarà Stoner. Trama vacua e personaggi farraginosi che sembrano appartenere al secolo scorso. Ik had al eerder kennis gemaakt met John Williams en zijn legendarische "Stoner", maar ook deze kleine roman - of eerder novelle - is een meesterwerk in miniatuur. Arthur Maxley, het hoofdpersonage in dit verhaal, was als kind getuige van een gewelddadige scène tussen zijn ouders. Het bezorgt hem een levenslang trauma. Williams laat ons het hele verhaal door echt "kijken" in de geest van Maxley, en dat gebeurt in detail en met veel psychologisch inzicht. Voor Arthur Maxley bevindt zijn "echte" l Ik had al eerder kennis gemaakt met John Williams en zijn legendarische "Stoner", maar ook deze kleine roman - of eerder novelle - is een meesterwerk in miniatuur. Arthur Maxley, het hoofdpersonage in dit verhaal, was als kind getuige van een gewelddadige scène tussen zijn ouders. Het bezorgt hem een levenslang trauma. Williams laat ons het hele verhaal door echt "kijken" in de geest van Maxley, en dat gebeurt in detail en met veel psychologisch inzicht. Voor Arthur Maxley bevindt zijn "echte" leven zich in een "vorige tijd", de tijd dat hij een zeer hechte, haast sensuele band had met zijn moeder. Het leven dat hij "nu" lijdt (het verhaal dat we lezen) is voor hem een donkere, angstaanjagende nachtmerrie. En dat "donkere", die duisternis: dat is echt het hoofdthema van deze roman "noir". In zovele, prachtige beelden lezen we tal van variaties op dit thema. Dit zijn maar enkele voorbeelden: p. 23: "Hoewel hij een hekel had aan zijn appartement, meende hij soms dat dit ruimschoots werd gecompenseerd door de aangename donkerte van de lange trap, en als hij naar beneden ging, de anonieme schemering in, was hij in staat zich minder bewust van zichzelf te worden; ook al duurde het maart kort, hij kon opgaan in de duisternis, er op een of andere manier deel van uitmaken." p. 77: "Toen hij de hal van het hotel uit strompelde, merkte hij dat het donker was geworden, dat de duisternis in stilte van boven was neergedaald om een oude strijd met de stad aan te gaan. De straatlichten en de elektrische uithangborden sputterden tegen, maar hun protest leek de enorme kracht van de nacht slechts te benadrukken." (wat me meteen echt aan de sfeer van een schilderij van Hopper doet denken!). p. 128: "Onvast begon hij aan de wandeling door de lange, smalle straat naar waar het donker werd en waar geen licht was, waar de nacht op hem drukte, waar niets op hem wachtte, waar hij, uiteindelijk, alleen was." De weinige mensen die Arthur ontmoet, zoals zijn vader en een meisje die hij in een danstent leert kennen (die, contrasterend met de duisternis van de roman, "Claire" blijkt te heten...) kunnen hem niet uit zijn nachtmerrie wakker maken, integendeel, hij herbeleeft telkens opnieuw zijn traumatische ervaring, wat hem uiteindelijk fataal wordt. Hij blijft alleen achter. Over eenzaamheid lezen we trouwens nog een mooie passage op p. 78: "De eenzame figuur in een onveranderlijke, uitgestrekte woestijn is minder eenzaam dan iemand die verdwaald is in de oneindigheid van een drukke stad. Wie alleen is in de woestijn is zich altijd nog bewust van zijn betekenis, hoe klein ook, en van de relatie tot de ruimte die hij kan zien. Maar iemand die alleen is te midden van een krioelende menigte, verliest zijn bewustzijn van zichzelf als individu. De honderden vreemde lichamen die onbewust tegen hem aan duwen, de honderden vreemde ogen die hem onbewust uitdrukkingsloos en zonder herkenning aankijken, de stemmen die boven hem, om hem heen, maar nooit tot hem spreken - daarin ligt de werkelijke eenzaamheid." Leggere il romanzo di esordio di uno scrittore molto amato è una sfida, un lavoro da speleologi, alle volte un atto di fede. Perché è inevitabile che tra il John E. Williams di "Nothing but the night" (1948) e "Stoner" (1965) ci sia un abisso di vita, di esperienza, di maturazione umana e letteraria. Leggendo questo agile libercolo è impossibile non rimanere ammirati dalla bellezza della prosa del pur giovane Williams, cifra stilistica che rimarrà indelebile e raffinata nei romanzi successivi. Dove Leggere il romanzo di esordio di uno scrittore molto amato è una sfida, un lavoro da speleologi, alle volte un atto di fede. Dove il racconto zoppica è nella frammentarietà del plot narrativo, nell'indecisione se intraprendere la strada del noir o del romanzo di formazione, in alcuni personaggi evidentemente "grezzi". Si potrebbe fare della facile ironia considerando questo volume nulla, solo un libretto, eppure è proprio qui che si intravedono e affondano le radici dei successivi capolavori. As this is the last book which I have read by John Williams,I can tell now why Williams remains one of my favorite and most outstanding writers I have ever read.In this particular book all of his unique characteristics as a writer are palpable.Nothing but the night is his first novel and the shortest in length, and while I was reading ,I could feel how his words are working.His words are penetrative,they float in the air till they reach the heart and they dwell and vibrate over there.he has the As this is the last book which I have read by John Williams,I can tell now why Williams remains one of my favorite and most outstanding writers I have ever read.In this particular book all of his unique characteristics as a writer are palpable.Nothing but the night is his first novel and the shortest in length, and while I was reading ,I could feel how his words are working.His words are penetrative,they float in the air till they reach the heart and they dwell and vibrate over there.he has the ability to take me into unprecedented ride with his protagonists like in Stoner,butcher crossing , Augustus and Nothing but the night.His poetic style is delicate , highly sophisticated befitting his recurrent themes;aloofness, obsession, sensuousness ,alienation and most importantly sentimentality. All in all, John Williams constitutes a genuine novelist , skillful in making his plot , simple in his prose and yet profound in his meanings. Ci sono due dialoghi eccezionali e due paragrafi perfetti. Per il resto l'ho trovato abbastanza banale e con una scrittura un po' immatura (il paragone con Stoner, ahimé, viene fuori anche se non si vuole). Temi scontati: il sogno, l'amore per la madre, l'avversità alla figura materna. Peccato. È però un bene che sia stato pubblicato il romanzo d'esordio di Williams. Onirico, poetico, bellissimo. Mai avrei creduto di poter apprezzare un romanzo del genere, così introspettivo, così ricco di non detti, eppure la prosa di John Williams è riuscita a compiere questa magia. C'è una potenza nelle sue parole, una forza straordinaria che è capace di innalzarle al di sopra della vicenda del protagonista e renderle applicabili ad ogni singola esistenza. "Ecco qual è il momento più bello della vita, il tempo perduto. Il tempo dell'estate, quando le foglie degli alberi s'intrecciano nella luce iridescente del sole." "Una volta ho visto un taglialegna in un bosco, su al Nord. Stava in mezzo a un fiume, in piedi su un tronco. Finché restava immobile, andava tutto bene; ma a un certo punto [...] ha cominciato a correre sul tronco, e il tronco si è messo a rotolare nell'acqua, e lui a correre sempre più in fretta. Finché correva, andava tutto bene, ma il tronco andava così svelto che il taglialegna non poteva fermarsi. Se si fosse fermato, sarebbe caduto giù, finendo in acqua. Per me è lo stesso. [...] ho cominciato a correre e adesso non posso più fermarmi, altrimenti cado. E se cado affogo, perché ormai non so più nuotare." "Perché è cambiato tutto in questo modo? O è sempre stato così? Mi sembrava di ricordare che un tempo… Ma adesso tutto è orribile, tutto è malvagio. Tu, io, il mondo intero, tutto. Non possiamo tornare indietro? Non possiamo essere come prima? Cos'è che non va?" "Una figura solitaria, nella distesa immutabile del deserto, appare meno isolata di un uomo che si perde nell'infinità di una città affollata. Chi è solo nel deserto resta comunque consapevole del proprio peso, per quanto minimo, e della relazione che mantiene con lo spazio circostante. Ma chi è isolato in mezzo a uno sciame di gente perde coscienza di se stesso come individuo. Le centinaia di corpi estranei che premono inconsapevolmente contro il suo, le centinaia di occhi estranei che lo guardano in viso con aria assente e senza riconoscerlo, le voci che gli parlano tutt'intorno, ma senza mai rivolgersi a lui, rappresentano la vera solitudine." The novel starts off with the protagonist alone inside his apartment room. It is not clear whatever he is feeling or thinking, but he seems to be in an eternally vacuous state bordering between dream and illusion. He has dropped out of college, separated from his estranged father, living from his family allowance in an apartment hotel, having almost no connections in real life, and drinking himself to forget something tangible and palpable, probably from some disturbing memory of his troubled ch The novel starts off with the protagonist alone inside his apartment room. It is not clear whatever he is feeling or thinking, but he seems to be in an eternally vacuous state bordering between dream and illusion. He has dropped out of college, separated from his estranged father, living from his family allowance in an apartment hotel, having almost no connections in real life, and drinking himself to forget something tangible and palpable, probably from some disturbing memory of his troubled childhood- a theme that recurs again and again throughout the novel. His estranged father- who tries to shove the past under the carpet- returns with a new show of feeling and emotion for his long separated son. The son comes to the realization- albeit for a brief moment, as if in a whim- of the long lost paternal bonding only to be reawakened to the untenability of it when he comes across one of his kept women. The deep psychological trauma is not very clear, probably something relating to his mother and her relationship with his father. And most of the time the novel gives the feeling that the protagonist was in a state of deep psychological trauma needing immediate psychiatric attention. He runs away from that encounter with his father only to immerse himself in a night of drinking and dancing and in the anticipation of a sexual encounter that goes awry as his troubled past comes to haunt him again in the form of a certain act of violence between his parents in his childhood. In the end what exists is only the night and the eternal solitude only to be disturbed by his blood bespattered face as the ghosts of his past return to seal his tragic reckoning. He pushed himself up, swayed dizzily for a moment, then regained his balance. Unsteadily he began to walk down the long narrow street toward where the darkness converged and there was no light, where the night pressed in upon him, where nothing waited for him, where he was, at last, alone. Tre stelle è solo per differenziarne il valore (decisamente minore) rispetto agli altri romanzi del medesimo Williams: Stoner e Augustus (cui ne avrei concesse anche più di 5 se fosse consentito) e Butcher’s Crossing, che 5 se non le raggiunge le rasenta proprio. Anche in questo caso quindi considerate almeno mezza stella in più, o quasi 4 se non esistessero i precedenti di cui sopra. Perché il libro è tutt’altro che così-così, ma un degno romanzo di esordio di uno scrittore ancora giovane (poco Tre stelle è solo per differenziarne il valore (decisamente minore) rispetto agli altri romanzi del medesimo Williams: Stoner e Augustus (cui ne avrei concesse anche più di 5 se fosse consentito) e Butcher’s Crossing, che 5 se non le raggiunge le rasenta proprio. Anche in questo caso quindi considerate almeno mezza stella in più, o quasi 4 se non esistessero i precedenti di cui sopra. Perché il libro è tutt’altro che così-così, ma un degno romanzo di esordio di uno scrittore ancora giovane (poco più che ventenne all’epoca) che troverà una perfetta maturazione, migliori equilibri, miglior senso della misura, solo con i 3 romanzi successivi (ed è un peccato che un quinto non sia mai stato portato a compimento e mai pubblicato). Sì, c’è qualche ingenuità, c’è qualche enfasi di troppo nel fare riaffiorare la “scena madre” nella memoria del protagonista che l’aveva nascosta per rimozione nei meandri della propria mente a generare incubi notturni, quella scena che ha comunque portato il giovane Arthur ad essere un solitario ed asociale parassita della comunità agiata e borghese dell’America a cavallo tra gli anni ’40 e ’50. Ma i personaggi sono ben delineati: il protagonista, l’amico petulante Stafford, il padre assente, e la fragile Claire che nella parte conclusiva del libro lo abborda in un Night Club. E sono tutti dei perdenti, degli sconfitti, degli afflitti dal peso di una irrimediabile solitudine, per questo trattati dall’autore con uno sguardo di pacata comprensione, e di evidente compassione quando le loro solitudini si incrociano e si toccano senza riuscire a compenetrarsi. E poi la notte, ora così liquida, ora un solido muro di buio: l’ambiente ideale per farvi muovere questi fantocci già segnati da un infelice destino. Williams made me feel such deep pity and so much sympathy for his main character that I wanted to cry for him in the end. John Edward Williams, Ph.D. (University of Missouri, 1954; M.A., University of Denver, 1950; B.A., U. of D., 1949), enlisted in the USAAF early in 1942, spending two and a half years as a sergeant in India and Burma. His first novel, Nothing But the Night, was published in 1948, and his first volume of poems, Th Librarian Note: There is more than one author in the GoodReads database with this name. John Edward Williams, Ph.D. (University of Missouri, 1954; M.A., University of Denver, 1950; B.A., U. of D., 1949), enlisted in the USAAF early in 1942, spending two and a half years as a sergeant in India and Burma. His first novel, Nothing But the Night, was published in 1948, and his first volume of poems, The Broken Landscape, appeared the following year. In the fall of 1955, Williams took over the directorship of the creative writing program at the University of Denver, where he taught for more than 30 years. “Stafford was late again, as he had expected he would be late. He signaled the bartender and indicated his empty glass. He burrowed a little more securely in his separate awareness, he nestled a little more deeply into his private darkness, and he waited.